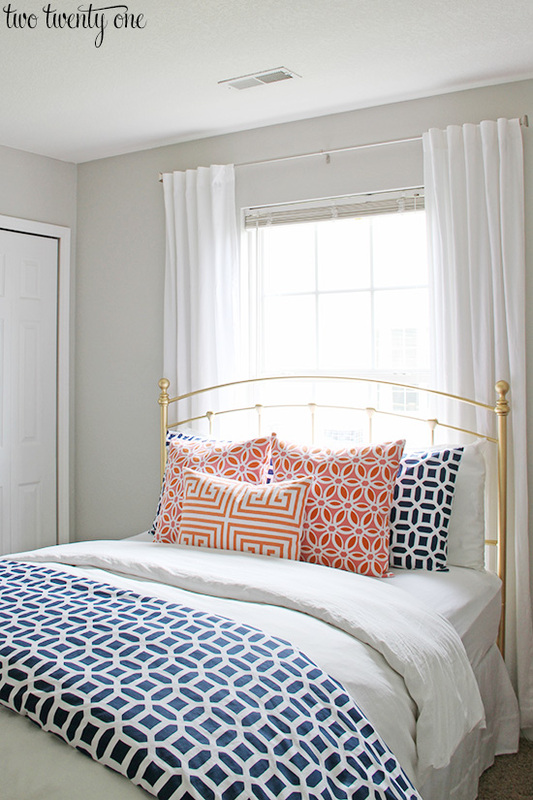 Thanks for all your sweet comments about our guest bedroom makeover. 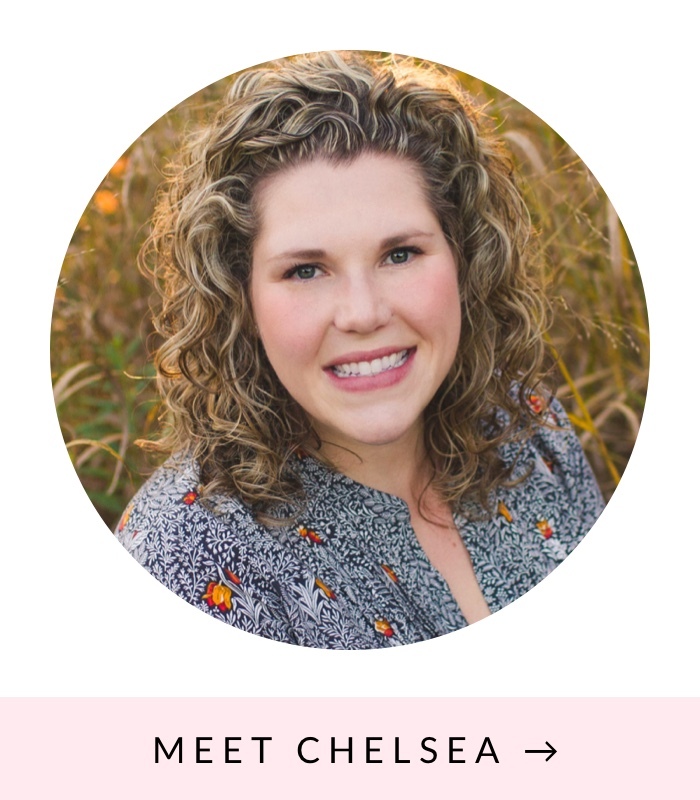 Today I’m sharing the details of the makeover. I’ll list everything I purchased, where I purchased it, and the price at the very bottom of this post. I painted the room Repose Gray by Sherwin-Williams. Like I said in the room reveal post, I think it’s the perfect gray. I purchased the paint during one of SW’s 40% off paint sales. Definitely hit those up. If I’m planning on painting a room, I’ll go on the first day of the sale and get samples (they’re included in the sale). Then I’ll give myself a few days to hem and haw over my choice. Finally, on the last day of the sale, I purchase the paint for the room. During the makeover process, we also replaced all the outdated, almond-colored electrical outlets and switches with shiny, new white ones. Here’s a tutorial on how we swap out the outlets switches. I’m so happy I found the navy, geometric duvet cover because it was exactly what I was looking for. It’s the Peyton duvet cover (in royal navy) from PB teen, and it’s currently on sale for only $89 (but that only includes the cover, not the pillowcases). When I purchased the duvet cover and pillowcases they weren’t on sale, but I receive PB teen promotional emails so I used a coupon and got both for $112. The shipping is what kills. I’m not a big fan of that. It’s probably because I’m so used to getting free shipping with a purchase over $50 from other stores. But if you’re serious about buying from PB teen definitely sign up for the emails and keep your eyes peeled for coupons. 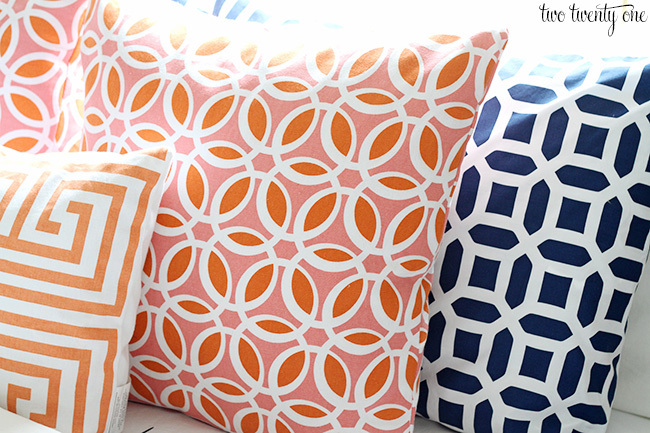 I really liked these particular coral and white pillows I spotted at Target, BUT they were $20 each. The two bigger coral printed pillows I ended up buying were 2 for $25 at HomeGoods so it was a no brainer to go with the less expensive option. The orange Greek key pillow is also from HomeGoods. The headboard is an interesting story. I purchased a brass headboard from a local thrift store for $15 a few months ago. I was told it was a queen size. So I brought it home and spray painted it gold (the brass was tarnished and scratched). Brad and I moved it into the guest bedroom to set it up and guess what? It wasn’t a queen size headboard. No, no it was a KING. I could’ve kicked myself for not double checking and measuring before I bought it and went through all the trouble of priming and painting it. I’m sure Brad was preparing himself for a monster preggo meltdown when we came to this realization. But instead, I calmly said some curse words, and we moved the headboard back in to the garage. Now, you may not know this but sometimes when I partner with companies to sponsored posts, like this room reveal, I have to turn in my posts weeks or months in advance. I was already cutting it close so when the headboard debacle happened I didn’t have any time to go thrift shopping for a new one. I scoured Craigslist and all I could find were $300-$500 brass headboards. No thanks. Ultimately, I ended up buying a black metal headboard off Walmart.com for $118 (that includes shipping and tax) and spray painting it gold. I’m pretty sure Brad’s words were, “So you’re buying a brand new $118 headboard, and then you’re going to spray paint it?” You’re darn right. And it turned out perfectly if I do say so myself. Obviously this isn’t how I wanted it to go but I was super pressed for time and in a sense paying for my carelessness of not measuring the original headboard. So remember, folks, always measure things. We’ve owned the nightstand for a couple years. I picked it up at a thrift shop for $10. I initially spray painted it white, but I decided to spice it up with coral paint (Sherwin-Williams Dishy Coral) for this room makeover. We’ve owned the rest of the stuff in the room for years, so there’s nothing to really report there. Here’s the final run down of where I purchased everything, including prices. If the headboard debacle hadn’t happened, I would’ve come in around $330. But like I said, I paid for my oversight. love that dishy coral color, great room for under $500! Thanks, Erin! Yeah, I don’t think $425 is too bad for a room makeover. 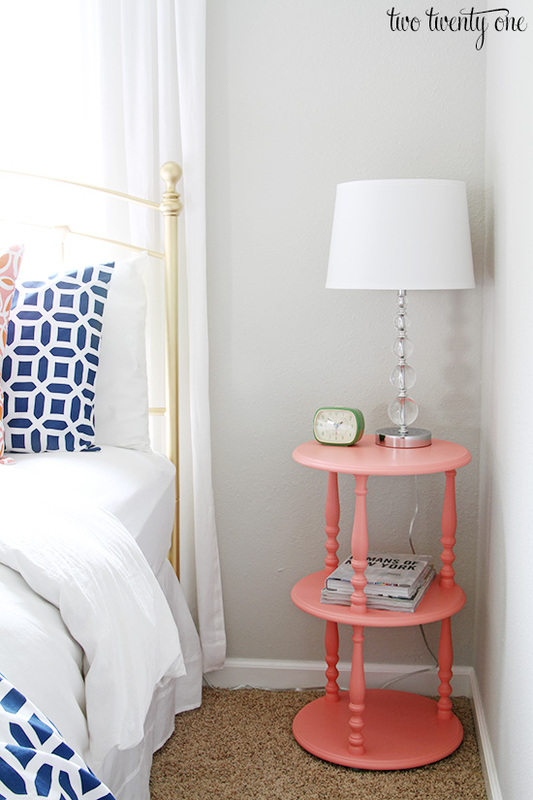 The coral on the nightstand is just perfect! I’ve tried for a playful salmon color in the past and completely missed the mark. Thanks for the color tip! No problem– happy to help. 🙂 It really is an awesome coral color. And if you hate it you’re only out a few bucks. 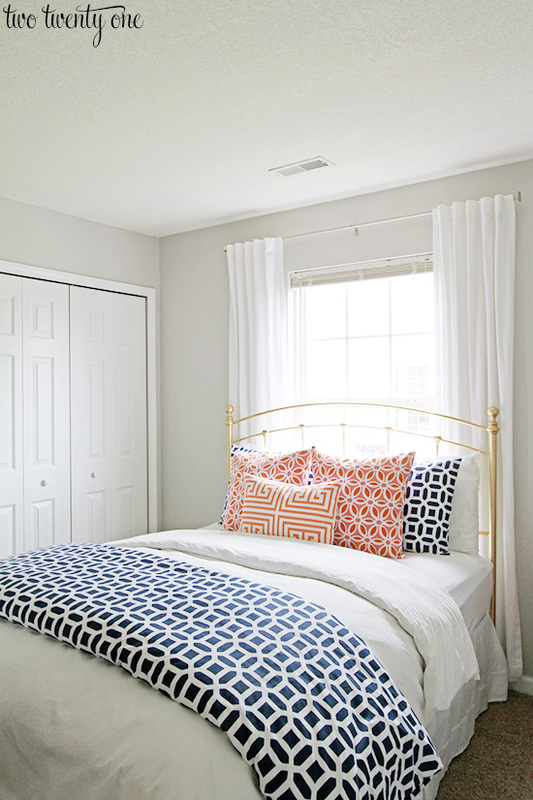 I love the Coral and Navy, I am actually in the process of re doing our master bedroom in coral and more of a turqouise blue. But after seeing your navy, I love that too! And I LOVE that little table. Great job all around! Thanks, Britny! 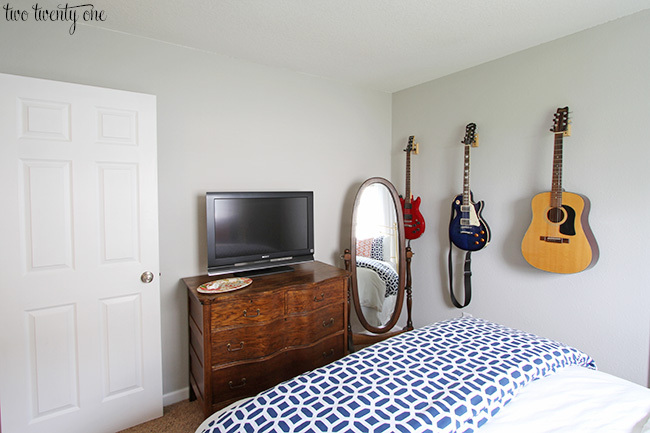 Good luck on the master bedroom makeover! I didn’t realize that Ikea had duvet covers?! I guess on my yearly trips I miss that section! 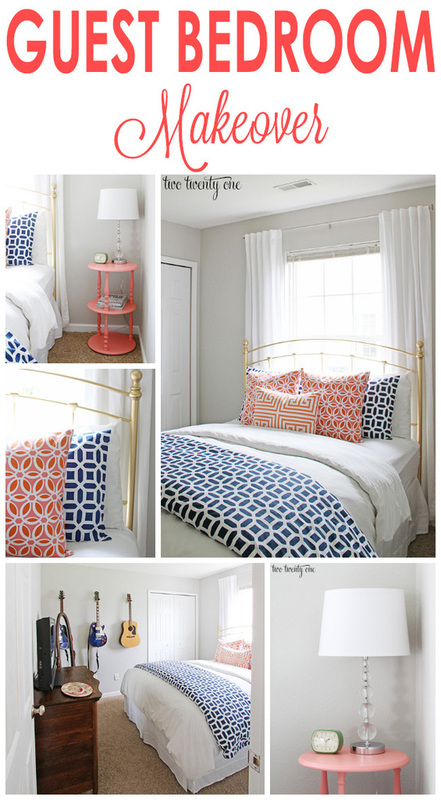 Love the Coral and Navy combo that you used for the bedding! Yep! I forgot where I learned that little tidbit. And you can’t beat the price! I love how you handled the guitars. I struggle with this a lot. 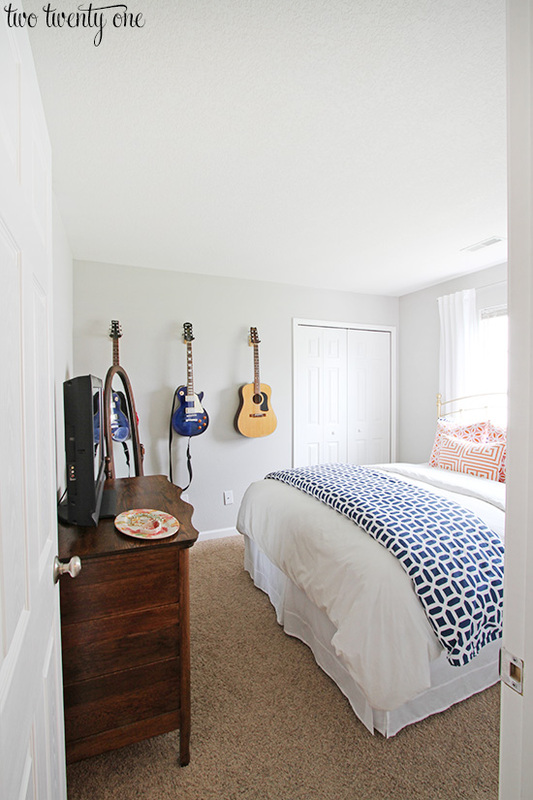 Wish I had a guest room – that seems like a great solution. And I love that they are all off the ground, too. This is beautiful! I love the colors and it all blends so well. You did a great job. By the way what are going to do with the old bed frame? I have a king size bed with no head board. I have looked high and low and can’t find one, not even a wooden one that doesn’t cost an arm and a leg. 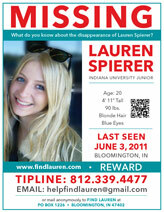 We live in Ohio and maybe we could come and get it. Let me know, thank you. Thanks, Shirley! I’ll probably just donate the headboard. It wasn’t my best spray paint job because I wasn’t used to spray painting brass. I don’t think it’s worth a drive from Ohio. Hah! I’d hate for you to drive all this way and be disappointed. well i couldn’t tell by the photos that the headboard was sprayed gold so great job! I would say the room is still under 500 bucks so you didn’t do too bad!! Thanks! It was seriously the easiest spray paint job ever. I think it had to do with the texture of the headboard metal. I love the coral and navy combination you chose! Looks great. What a bummer about the bed! But you did a great job on this one. It looks awesome! Thanks, Tiffany! Yeah, it was a disappointment but totally my fault. I’m glad it worked out in the end though. Love how this room came together. I noticed you mentioned getting some of the room pieces at a local thrift store, I am an Indy native at well and was wonder what thrift stores you hit up? I recently stumbled across your blog and I am hooked. Great job! I actually found the nightstand at Goodwill but I haven’t stepped foot in a GW or GW Outlet in over a year (read all about that here: https://www.twotwentyone.net/2013/07/fabric-covered-books/). I purchased the original headboard from City Thrift on East Washington St. I also check out Value World from time to time.